I had an adventurous weekend this weekend. Well, Friday wasn't adventurous, but I went to the rock climbing gym. Saturday I packed up the car and set out to explore a few smaller towns around Boulder. I visited Louisville first, and found it to be really very nice. The outskirts are mostly recent but not brand new housing developments. The nice thing is that they are clearly housing development communities built by a single developer but they have stand alone houses ("detached single family dwellings" as I've learned in my home buying studies) as opposed to townhouses, which is nice. The downtown area is small but very nice. I checked out the public library and walked through most of town and a few nearby residential blocks while catching up with Kate on the phone. Downtown is almost all local boutiques and restaurants, which is nice. I had lunch at Bob's specialty sandwich shop, and they have a chocolate shop as well, which is a plus. It seems many things are only open Saturday morning, though. Anyway, Louisville is a definite possibility. I saw a few houses for sale and even one that was having an open house, but I couldn't muster the moxy to go in and tour it. From Louisville I went out in search of Broomfield. I searched, but all I found was gigantic strip malls and endless townhouse developments. I couldn't seem to locate anything resembling a town center, so Broomfield seems out. Next I made the longer drive toward Greeley, navigating by the wallet-sized map of Colorado in my U.S. road atlas, which leaves some details as an excercise to the driver. On my way there, I passed through Longmont. The Longmont downtown was decent, but I was a bit set back by a few pawn shops, gun stores, and some office dealing in "Corrections Management" or something like that. Next was Greeley, which turned out to be just awful from what I could tell. The downtown is approached by a Route-22-esque highway packed with strip malls on either side. Downtown itself has a weird ghost town feel and was mostly desolate around three in the afternoon on a Saturday. There are also train tracks dividing the town in half and limiting the number of places you can cross. Beyond down town the residential neighborhoods were totally unappealing. All the houses looked like they peaked in about 1972 and had been poorly maintained since then. Definitely off the list. From there I headed out to Steamboat Springs, having packed up all my ski gear in the car in the morning. On the way I drove through Fort Collins where HP has a big office, but I didn't explore at all as I wanted to do as much of my drive to Steamboat in the waning daylight. I may go to Fort Collins one day this week to check it out. The drive to Steamboat was rough. I only had daylight for the first hour, and then I drove most of the four-hour journey only the 2-lane, windy, steep, mountainous highway 14. It was slow going indeed and icy in some spots. Sadly the roads here are mostly not black but a very washed out light gray that is low-contrast to what's left of the white side lines and yellow center lines. Add to that a layer of dirt and you're basically driving by the patterns from tire marks in the road. Apparently they haven't figured out the whole reflectors in the road thing. I had good music with me, but the drive was still very long and slow and nerve racking. Although that first hour in daylight was pretty scenic. I pulled over at one point to get some snacks from the trunk and looked up at the sky. This was when it was completely dark and I was deep into the mountains. The night was clear and the sky was awe inspiring. I only glanced up a moment though as it was cold and windy and I wanted to keep on trucking. As an aside I want to state for the record that Queen's Shear Heart Attack is the greatest album of all time. I arrived at Steamboat Springs around 9 pm and hunted down a motel room. Even the Super Eight was $108/night, sadly, but I gues that's the story in a destination resort. Then I drove into town, walked up and down the street a bit to check it out, and then selected a Mexican restaurant for my ski-fuel burrito. I ate quickly and headed back to hit the sack. 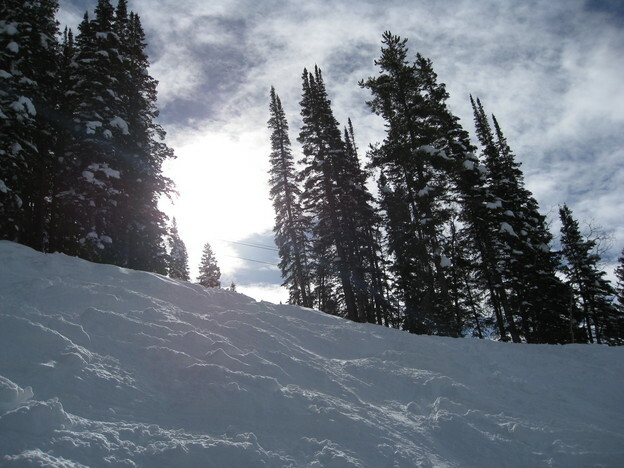 Sunday I skiied the world famous Steamboat Springs. The first few runs the light was incredibly flat due to cloud cover, so there's just not enough relief to see the terrain. It literally was like skiing on a white photographer's backdrop - except the backdrop wasn't flat. However, the sun did come out for about two hours in the latemorning, which was terrific. 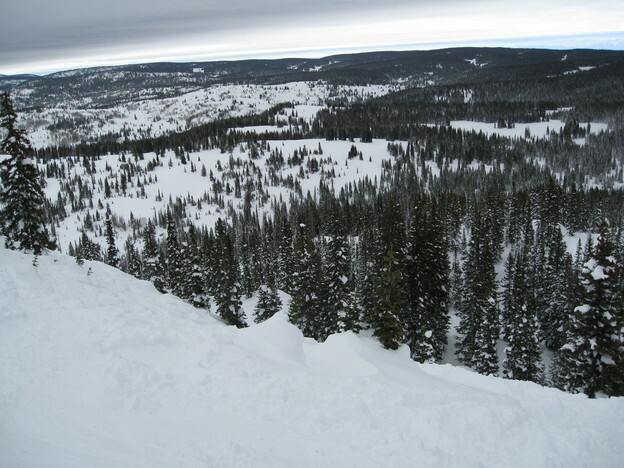 I found some nice runs with some scattered trees that had deep snow and interesting features. 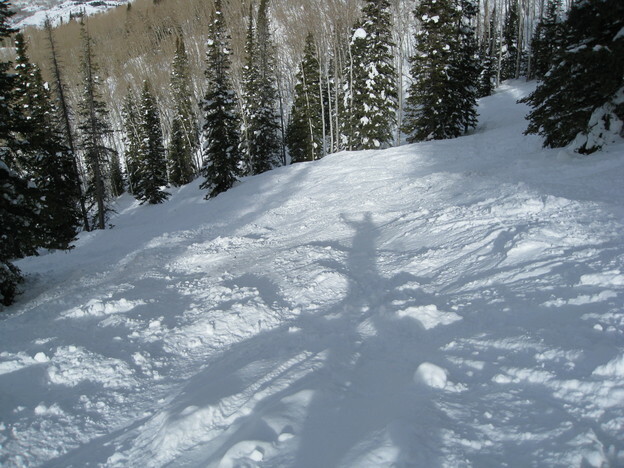 One thing that Steamboat does really well is make runs where the only clear away some of the trees to give you a nice middle ground between a fully cleared slope and dense tree skiing. Steamboat is also recognizable for the fact that much of the forest is birch trees in addition to the more common pines. There was plenty of snow, although it was not fresh so it was a bit heavy and sticky. I stopped for lunch at a small mid-mountain hut that was standing room only so I had to eat outside. By this time the wind had picked up considerably and the cloud cover was returning. This was almost enough to get me bummed out, but I decided to go check out the back side of the mountain where they have some bowls and more open skiing. The skiing on the back side was really great and very new for me. I even took off my skis and hiked up to one of the double black diamond runs. The first bit was very steep but had the deepest powder I have skied in, so you don't have to worry about falling because it's two feet of fluffy snow the whole slope. So I made my way down that and into the next section which was denser trees, which I navigated a bit cautiously since I don't ski with a helmet (although I think next year I might start). Once I got down through those trees it dumps you out into a vast flat clearing. This was just spectacular. It really gave me a sense of how beautiful the snow-covered trees are and the fact that I had to hike a ways then ski down a double black diamond to get to it made me feel priveleged to be there. There are some photos and a video linked below. I ended up skiing until past 3:30, which is somewhat unusual, before taking the shuttle back to free parking and getting ready to head home. I thought because I was taking a different route back to Boulder I might get to a respectable highway sooner, but no such luck. The drive back ended up being even more treacherous than the drive there - partly because this time there was more traffic building up behind me in my slow moving Sentra. I had to pull over about four or five times to let faster traffic pass on the steep, curvy, mountain roads in total darkness. After over three hours of bare knuckle driving I was relieved to finally get onto I-70 and drive 25 mph in traffic toward Denver. I forget which road I was getting on to, but toward the end getting onto 93 north or maybe route 6 as I made the left hand turn onto the road from the off-ramp of the previous road, again thanks to the zero-contrast road painting plus fatigue, I very briefly drove the wrong direction on a divided highway. It only took me a few yards to realize my mistake, and thankfully there were no cars in sight in either direction (initially), but let me tell you, that realization gets your heart rate going. Thankfully, I was able to make a quick U turn and get back on the correct side going the correct direction with only one car passing me in the other lane head on. I was surely relieved to arrive back home in Boulder and scratch my puddy tats. Note to self: no driving in the mountains at night.